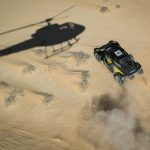 After the arrival of the special stage yesterday at the bivouac, this Thursday morning, the starting line was set up a few dozen meters from the AFRICA ECO RACE camp. A comfortable situation for the competitors who earned some well-deserved extra sleeping time, especially for those who arrived late during the night of the second stage which was very tiring. Luckily, today was without much difficulty for the participants, and therefore no bad surprises or incidents to declare. 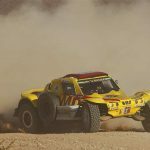 After three days of racing, a certain hierarchy is being set in this 11th edition of the AFRICA ECO RACE, should it be two or four-wheel category. We can’t say the motorbike drivers were very enthusiast upon their arrival, unlike some of their colleagues from auto-truck category. Indeed, the moto drivers do not appreciate much gravel tracks and that was most of today’s stage. But regardless, there was still some good mood in the air, even for Simone AGAZZI, who after falling off his bike, asked us where all these stones were coming from ! The Italian pilot takes 3rd place, 11’32’’ from Alessandro BOTTURI, winner of the stage with 2’38’’ in front of Pal Anders ULLEVALSETER. The YAMAHA of the Italian leader has now 7’07’’ on the KTM of the Norwegian. A small head start who does not seem to worry much the double champion who is looking forward to the next stages. Amongst the notable performances of the day, Martin BENKO finished 4th with 32’29’’. The Slovakian, known for his regularity is 5’25’’ in front of Francisco ARREDONDO who’s back in the top 5 of the special stage. The first of the +700 is Paolo CAPRIONI in 12th position. The Italian is ranked ahead Jan ZATKO, first in +450 category. In the general ranking, it’s the Swede Henrik RAHM who leading the +450 category and again CAPRIONI for the +700. 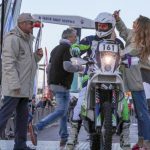 When it comes to the only female competitor of the race, Julie VANNEKEN, despite arriving late last night, the French took a good start this morning and is driving her way slowly straight to Dakar. Sometimes we ask ourselves if Jean Louis SCHLESSER doesn’t have the gift of clairvoyance. Indeed, you can remember that during the podium start in Monaco, the 6 time winner of the race declared that competitors should pay attention to Dominique LAURE who could come with surprises. Maybe this is what boosted the French pilot as once more, Dominique LAURE et Christophe CRESPO were ahead and no other competitor was able to catch up. We can clearly state that “Malabil et Malabar”, the “Fous du Volant” OPTIMUS N°211 are dominating the category. By staying ahead of Jean-Pierre STRUGO and François BORSOTTO by 1’42’’, as well as Jean Noël & Rabha JULIEN by 7’26’’, they are confirming their leadership on the temporary general ranking and have now 16’46’’ in front of STRUGO/BORSOTTO and 48’59’’ ahead of the JULIEN family. Again in the general ranking, another side competition is taking place between the TAREK of Yves FROMON & Paul VIDAL and the one of Patrick MARTIN & Didier BIGOT, 4th and 5th place with less than 10 minutes separating them. 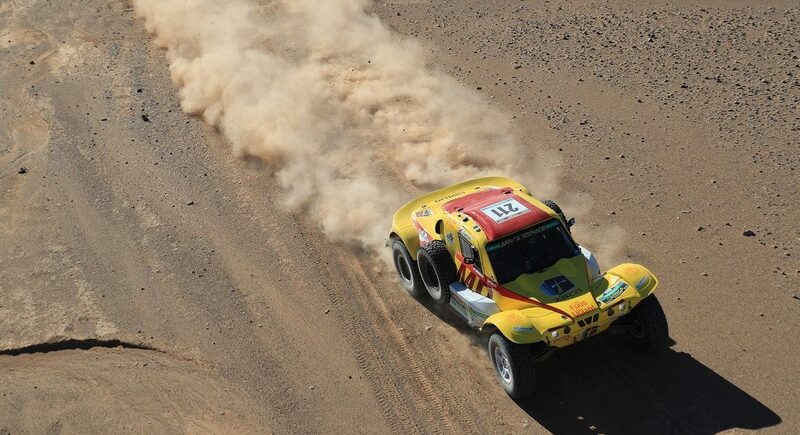 Still in the general, in their NISSAN NAVARA, François and Stéphane COUSIN are still leaders of the 4×4 category, in 13th position when Alexey TITOV and Andrey RUSOV’s FORD RAPTOR are still in the lead of the T2 category. Satisfying performance also of the French driver Rudy ROQUESALANE & Vincent FERRI, 1st in SSV category and 11th overall in their CAN AM X3. VICTORY FOR BOUWENS BUT JACINTO TAKES THE TRUCKS LEAD. 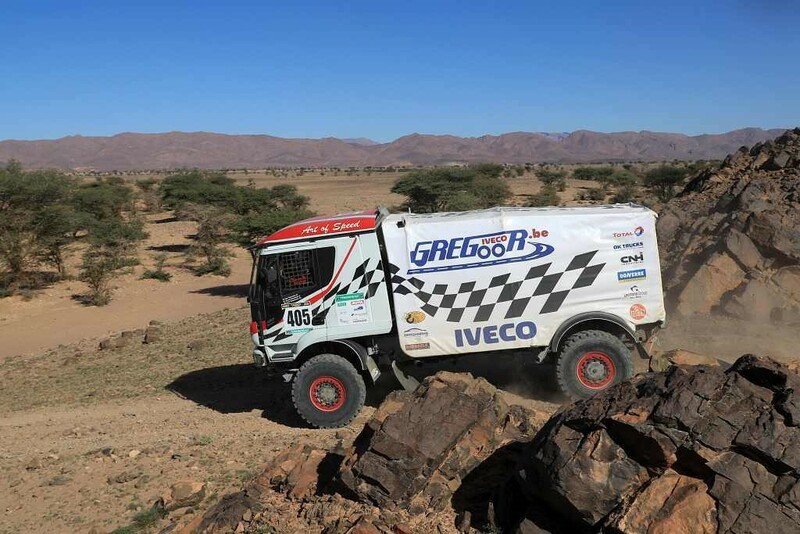 Once again on the AFRICA ECO RACE, the competition is raging in the truck category. After loosing three hours yesterday due to steering issues on the IVECO, Igor BOUWENS, Tom DE LEEUW & Ulrich BOERBOOM succeeded today and got 6th place on the auto/truck scratch. But the Belgiums still have competition with Elisabete JACINTO, José MARQUES & Marco COCHINHO who finish 1’30’’ behind. Therefore, the MAN ends up in 6th place in the overall auto/truck ranking. The Portuguese driver is now head of the truck category with 9 minutes ahead the Tatra of the Czechoslovak Tomas TOMECEK. On board his MAN, the Belgium Noël ESSERS is for now still in 3rd position in front of the Netherland GINAF of Aad VAN VELSEN. Tomorrow, Friday 4th of January, the AFRICA ECO RACE with head down South to join Fort Chacal. 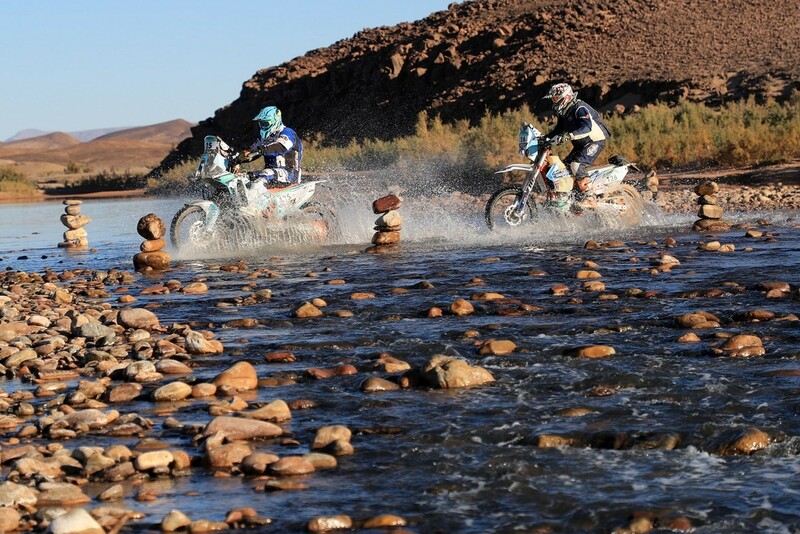 A special stage of 495km during which, once again, navigation will be the key to the podium. It was an interesting navigation game today. Especially at the end of the track. Rabha, my co-pilot was simply amazing. We also hit a tree due to the dust from another competitor. But no major damage on the Buggy. 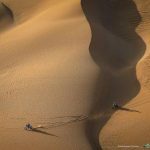 Besides that, we are impatiently waiting to the special stages in Mauritania, even though the ones in Morocco are magnificent. 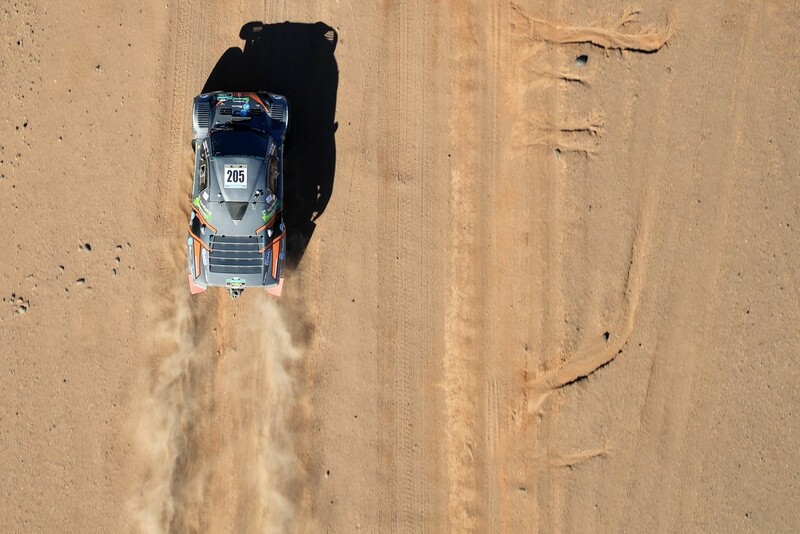 Besides a flat tyre due to a rip of the flexible air cable, the special stage was quiet. Navigation was difficult but we didn’t get lost. The road ahead is still long and as said René METGE,: “We need to bring a new car back to Gao”. 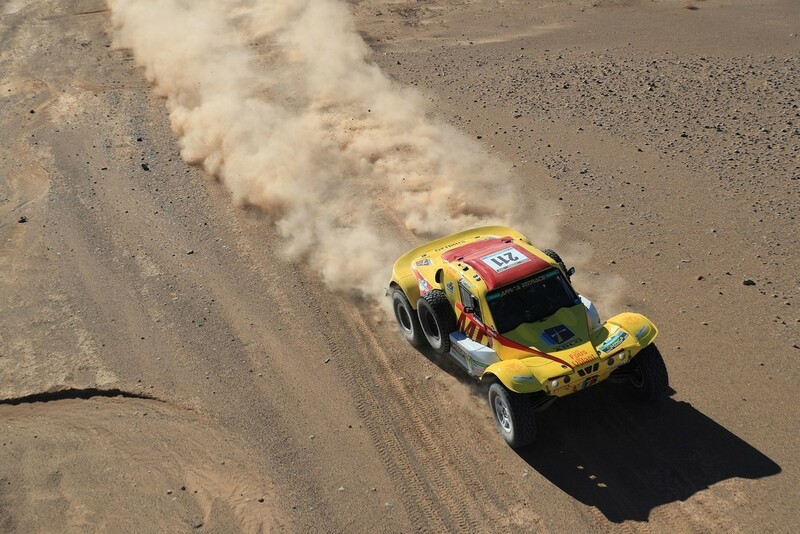 Here, our objective is to,bring back the car new to Dakhla and then we will see what happens. It is yet again another beautiful special stage but the large quantity of stones requires full attention. Navigation is very complicated but this is what I like about the rally. We drove well with Pal Anders ULLEVALSETER. For now, all is well for me and the moto. We will continue this way the longest possible. DAY 5 – Balkan Offroad Rallye – Driving on the ‘red line’! 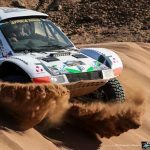 AFRICA ECO RACE 2019 ALL ENDS WELL !